High performance artificial intelligence (AI) on the cloud uses information about CIP4 / JDF to instantly create the best cutting procedure. Follow easy-to-understand instructions shown in an animation to carry out the job like a skilled operator even if you are a novice. 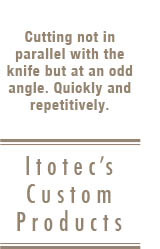 Itotec’ s eRC Series paper cutting machines working in cutting fields all over the world. Easy-to-handle and accurate. And the safety of the operator is also pursued. The wide line of products ranges from single sliding drive small machines to double sliding drive standard machines to large size machines. Combination of an epoch-making L-shaped layout and one-chuck transfer. With a moving line of minimum loss time, one-person operation is possible. High productivity is realized with a low cost. While the paper is sandwiched at both ends between plates, the table is pulled out so that paper is stacked on the pallet. The optional gripper unit increases paper stability and helps stack the paper more beautifully. The maximum stacking height covers a wide range. 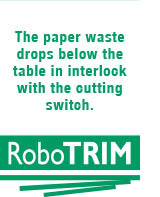 Each time paper is cut, the cutting waste automatically drops below the table. (Function ON/OFF selection possible) In addition, with an optional damper for automatically collecting paper waste, interruption of work for dust discharge is eliminated. 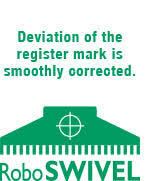 Correction of deviation of register mark indispensable for accurate cutting operation. This fine adjustment can be made with the accurate swiveling mechanism of the backgauge quickly. In addition, values can be entered while they are checked on the monitor screen. Work is speedy and assured.